They came with an open mind to learn and to understand. Parishioners, clergy, religious and interested community members. About 25 of them. 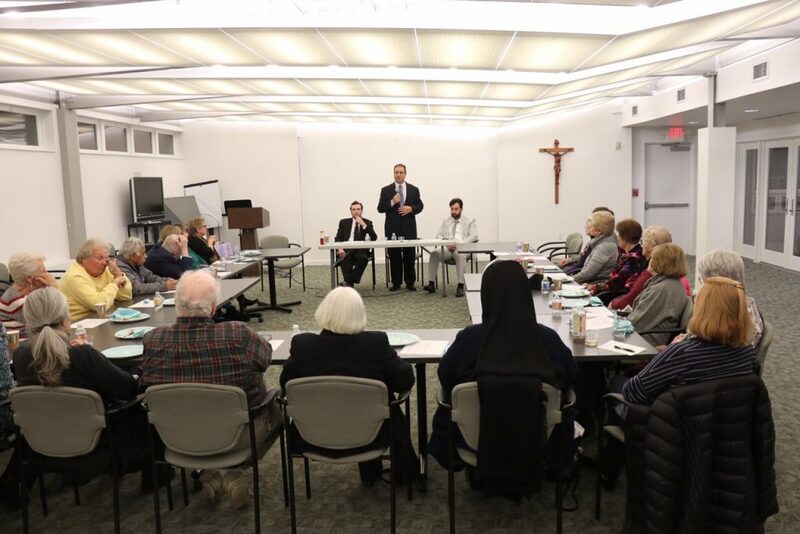 They gathered in the parish center of Saint Thomas More in Cherry Hill to share a meal as Catholic Charities panelists shared with them some of the journeys that bring refugees from war torn areas around the world to new lives here in the United States. They asked lots of questions: What is the vetting process? Who decides which refugees come into the country? How do you ensure that these refugees aren’t a threat? Why do refugees leave their home countries? What happens once refugees arrive in this country? What’s the role of Catholic Charities? Daniel Davis, an AmeriCorps volunteer with Catholic Charities and fluent Arabic speaker, described the application and vetting process, which typically takes three years of extensive background checks and verification that applicant families are in grave danger if they remain in their homeland. Eyes widened and whispers filled the room as Davis shared short stories of refugees who he works with as a case manager — as well as the situations that led them to flee. The panel discussion was held in light of the Share the Journey campaign launched by Pope Francis, which calls Catholics and all people of good will to listen to stories of migrants and refugees and provide meaningful places for them to interact — and by doing so, creating a culture of encounter. Another panelist was Tarek Mousa, a native Egyptian, Coptic Christian, and currently an ESL (English as a Second Language) teacher for Catholic Charities. Mousa detailed various volunteer opportunities for South Jersey residents interested in becoming more directly involved with helping newcomers to the area assimilate and settle. He also described ways that refugee clients themselves get involved in the community and immerse themselves in American culture. “The refugee resettlement program is only as strong as the community that supports it,“ added Daniel Davis. Others chimed in, asking whom they should write checks to in order to help families start their new life here in the United States. Offering a first-hand account of refugee resettlement was Moustafa Aldoori, a case manager for Catholic Charities who helps clients find housing and employment. Fifteen years ago, Aldoori lived comfortably with his family in Baghdad, Iraq. His father owned his own business and the family was thriving financially. But the war changed everything. “The city and the country lost stability. We would hear about people getting robbed, kidnapped, and threatened with death. But we had a good life there. We didn’t want to leave,” he explained. That decision to stay almost proved fatal when Aldoori, 15 years old at the time, was kidnapped and held for ransom for nine days, where he was beaten and tortured. His attackers would repeatedly call his parents, demanding a price for their son’s return. 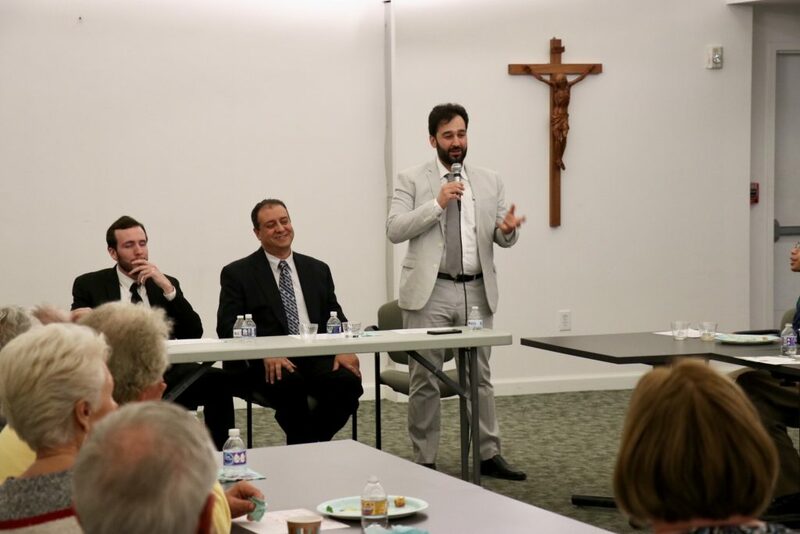 Moustafa Aldoori, a case manager for Catholic Charities, speaks at a panel discussion on refugee resettlement at Saint Thomas More Parish, Cherry Hill. After being kidnapped and held for ransom for nine days when he was 15 years old, he and his family went through a three-year vetting process to come to the United States. Seated are two other Catholic Charities representatives, Daniel Davis, (left), an AmeriCorps volunteer, and Tarek Mousa, an ESL (English as a Second Language) teacher. The family was left with no money — and no option but to flee their country to Syria, which was safe at the time. 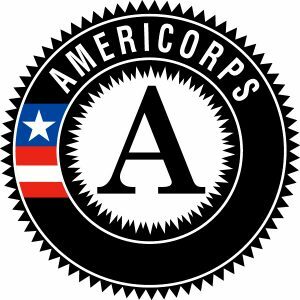 After a three year screening process, Aldoori arrived in the U.S. in 2008 with his family, but no money and no English skills. He was resettled in South Jersey through Catholic Charities who found him a home and helped the family find work. He worked two jobs and saved for college, began working for Catholic Charities, and now has a real estate license. The attendees introduced themselves to panelists as the evening wound down, shaking hands, thanking them for sharing their stories, and asking what they can do to help support and engage with their refugee neighbors in their community.